In 2017 I think it's time to really get serious about the things we eat, making better food choices. 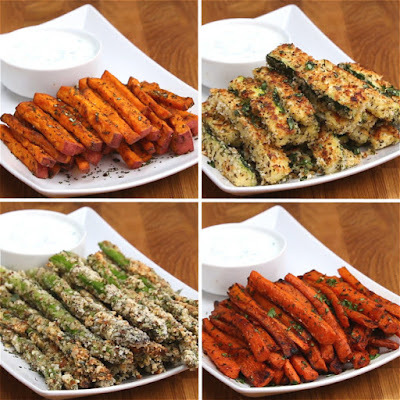 So, today I would like to share four veggie fry recipes that may have us all going crazy for more.. ENJOY! PREPARATION 1. Preheat oven to 425°F/220°C. 2. Cut sweet potato into fries and combine in a large bowl with olive oil, rosemary, salt, and pepper. 3. Place in a single layer on a baking sheet lined in parchment paper. Bake for 20 - 25 minutes, flipping halfway through. 4. Prepare dip while fries are baking. Combine all dip ingredients in a small bowl and set aside in the refrigerator until ready to use. 2. Cut zucchini into fries and set aside. 3. In a large bowl combine panko, parmesan, garlic powder, basil, salt, and pepper. 4. Whisk eggs in a shallow bowl or dish. 5. Dip zucchini in eggs, coating evenly, and then toss in bread crumb mixture. 6. Place on a baking sheet lined with parchment paper. Bake for 15-20 minutes, flipping halfway. 2. Cut carrots into fries and combine in a large bowl with olive oil, parsley, paprika, salt, and pepper. 3. Place on baking sheet lined with parchment paper in a single layer. Bake for 20-25 minutes, flipping halfway. 2. Cut off about 1-2 inches of asparagus ends. Set aside. 3. In a large bowl combine crushed almonds, parmesan, garlic powder, oregano, salt, and pepper. 5. Dip asparagus in eggs, coating evenly, and then toss with the bread crumb mixture. 6. Place on a baking sheet lined with parchment paper in a single layer. Bake for 15-20 minutes, flipping halfway.